UNITED NATIONS, New York – Global leaders broke new ground today with a historic agreement that “rallies all partners around collective commitments to protect the human rights of all refugees and migrants,” said United Nations Secretary-General Ban Ki-moon at the opening of the Summit for Migrants and Refugees, held at UN Headquarters in New York. Member states of the UN approved by consensus the New York Declaration, an agreement that commits leaders to address the unmet human rights needs of the largest population of migrants ever seen. The numbers are stunning: There are an estimated 244 million international migrants in the world today, an unprecedented level of mass movement. And more people have been forced to flee their homes than at any time since World War II. All of these travelers face enormous perils, with many falling prey to abuse, exploitation, trafficking or violence. Others find themselves falling sick, becoming injured or becoming pregnant without access to care. The New York Declaration commits world leaders to protect the human rights of all refugees and migrants, regardless of their status. This includes protecting those who are most vulnerable: women and girls. 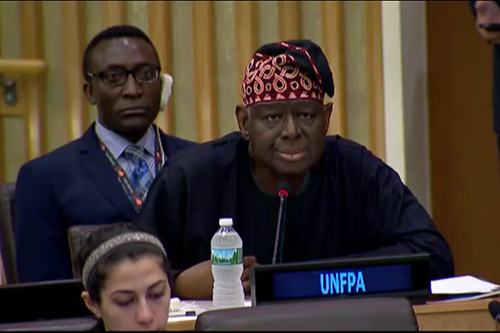 “Women and girls… make up an increasing proportion of migrants,” UNFPA Executive Director Dr. Babatunde Osotimehin said at the Summit. The Declaration additionally calls for providing sexual and reproductive health services, preventing and responding to gender-based violence and working to end the xenophobia targeted at so many refugees and migrants. And it starts the process of negotiating a comprehensive global compact on safe, orderly migration, planned for in 2018. These efforts must include measures to ensure that migration is voluntary, heads of state, civil society leaders and UN officials agreed at a roundtable session during the Summit. Investments in young people are essential to ensuring they have a future – whether that future is at home or abroad, emphasized Dr. Osotimehin. Video still from UN TV. People migrate because of “a basic hope that life will be better in a different place – a hope that often reflects reality, given the stark inequalities in economic opportunity and human rights between countries,” Dr. Osotimehin said. “How can we create conditions that allow people to live in peace and prosperity in their countries of origin, so that people can migrate by choice rather than necessity?” asked President of Zambia Edgar Lungu, who co-chaired the roundtable. One way, participants stressed, is by assuring young people that rights and opportunities are not only available outside their countries’ borders. Countries can improve lives, strengthen economies and spur development “by advocating for the empowerment of all young people, and working for, and with, them to expand their life chances and choices at home through better health programmes and giving them a better voice in decisions that affect them,” Dr. Osotimehin said.